The communion rail is a dominating feature which complements the beautiful altar of the Immaculate Conception. It is made of fine rosette orange, cream and white marble from Carrara , Italy . 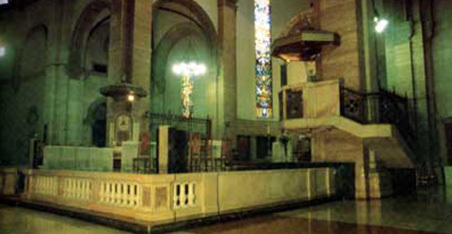 At its center are two small wrought iron gates leading to the altar table. Each gate is designed with cast bronze sculptures at the center depicting a lamb and a swan. Encompassed by the communion rail are the Episcopal Throne, found the left of the altar table, and the pulpit, found on the right.